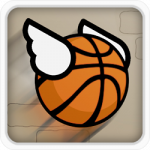 Now we want to recommend to all of you a new challenging game besides the classic ones – Flappy Dunk game. How do you think about a Flappy bird combining with basketball? With no doubt, this combination leads to an incredible experience.